Why Select LAWN KINGS Synthetic Grass? - Lawn Kings Inc.
Why Select LAWN KINGS Synthetic Grass? There are numerous and compelling reasons to select synthetic grass, regardless of the supplier or installer, however having a good installation by an experienced crew is paramount. Take house painting for example, you could have the best most expensive paint in the world but if the painter is inexperienced, doesn’t prepare the surface properly, does poor work, etc. you will end up with a finished project you won’t like. Tired – seems like an odd reason, right? Yet we have heard from homeowners and managers of commercial properties that they are just tired of changing out natural sod. We’ve run into people who over the years who have replaced natural sod 3 and 4 times. No Maintenance – actuality synthetic grass is better described as “virtually maintenance free”, there are a few minor tasks you’ll need to do like utilize a leaf blower or broom and maybe hose off a dirty or dusty part but that’s about it. Compare this activity to all the mowing, reseeding, fertilizing, etc. and having to do it in the hot summertime sun. Appearance – once you have seen a few before and after pictures you really understand the attraction. Modern synthetic grass has different blade shapes, blades with different and sometimes unique and attractive colors, and contrasting fibers, that all contribute to a natural looking appearance. As mentioned above, there’s lots of good compelling reasons to select synthetic grass in general. We can honestly acknowledge there are, let us say a few good companies who have good products and do good work. We don’t claim to be the best, because we don’t feel we should crown ourselves, but we do feel justified in saying and do believe we are simply one of the best synthetic grass companies. Safe Synthetic Turf Fibers – made from polypropylene, this is the same material used in baby bottles and disposable eating utensils. Testing & Documentation – we test all our products at an independent laboratory specifically for lead and heavy metals. Homeowner Associations (HOA’s) will often request a synthetic turf sample and our documentation package we have available for every artificial turf product we offer. Backing – the “backing” is typically the black (sometimes green) layers that the fibers are weaved into. For our products we use two layers so the fibers will not pull out easily. The two layers function as a two-layer weed barrier. Accurate Weight – it’s a little nerdy or technical but we list “WEIGHT” of the product as actual “FACE WEIGHT” this truly means the weight of the product, per square yard of the turf fibers to NOT include the backing. Some suppliers and installers cheat this industry norm by listing “total weight”. Product Warranty – Lawn Kings provides a 15 Year Limited Warranty that in effect protects against fading, breakdown or degradation due to exposure to natural ultraviolet rays. We are happy to send you a copy if you like. Labor Warranty – Lawn Kings offer a 2 Year Labor Warranty as well. Simple Quick Claims Process – to make a claim we ask for a copy of the original receipt and original warranty provided by Lawn Kings, in addition we ask for photos, description of the issue with signature. Lawn Kings, Inc. – We have been in business for 10 years and the warranty is only as good as the company behind it. Working 8 Days A Week – just kidding, a Beatles song. Seriously though, our crews and authorized installers are experienced individuals who have been installing synthetic grass / artificial turf for years. As mentioned above this really is a key reason to select Lawn Kings. Should you have a smaller project that would not require any seams there a possibility you or your gardener could do it but for something larger experience really counts. Equipment and Use – we have all the standard equipment, such as sod cutters, plate compacters, and related hand tools. One item that even some synthetic grass installers and amateurs don’t know to use is a carpet kicker. This tool stretches the turf tautly over the surface to prevent wrinkles. If you ever see wrinkles in synthetic grass installation it is likely they didn’t use a carpet kicker. Awards for Lawn Kings, Inc. Competitive & Fair – we find our prices are very competitive and we think fair for the quality product and quality installation we provide. We won’t say we are the cheapest but we think when comparing similar products and installation methods we are very competitive. 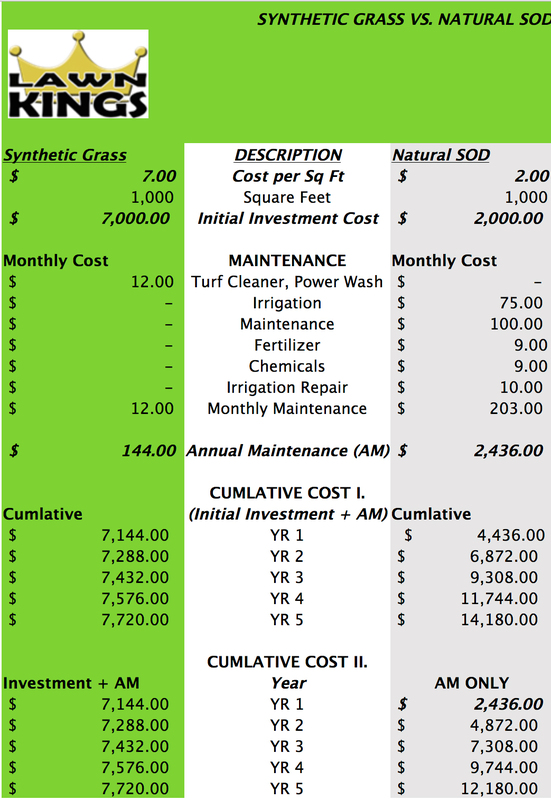 Complete Price Quote – we mention this because we know of a couple of the larger synthetic grass companies will provide a seemingly low or competitive quote for the turf and then will add on additional products such as; Edging (BendaBoard), Infill (Zeolyte or other), Accessories (Nails & Staples, etc.). Lawn Kings typically will provide one price for the entire project with the turf you select. At the very least we suggest it’s in your interest to contact Lawn Kings, Inc. whether you are certain you want to go with synthetic grass or you are just shopping. 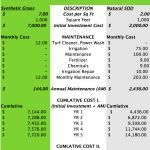 We are happy to answer any questions you may have about synthetic grass or installation questions and as always, we offer FREE SYNTHETIC GRASS ESTIMATES. Give Lawn Kings s a call today!